The watershed project in Dungaria, a remote village in Madhya Pradesh state in India, has not only helped women farmers to conserve rain water, grow new crops and better crops but has also brought a transformation in their thinking. Stacks of rice bags on the verandah, a solar-powered streetlight brightening up the courtyard and a dish antenna popping out of the thatched roof of Janki Bai’s home take you by surprise. Rainwater harvesting pond on Janki Bai’s plot. Rice in a semi-arid region? How about streetlights in an isolated village where even grid connectivity even in 2025 seemed to be a remote possibility? Even the approach road to Dungaria village, set in rocky mountain terrain, is unmotorable. Getting to Janki’s home is literally an uphill task! Get talking to the villagers and you understand that this change is recent and the seed for this change was sown by a watershed initiative. The awareness levels and community spirit in the village that was sparked off and fostered by the watershed initiative has seeped into almost every area of their life. Be it getting solar power to their village, or putting to good use various government schemes, or women getting wages on par with men, the folks of Dungaria are now proactive. This initiative had an important partnership with international scientific researchers, national government and local NGO partners. It was led by the International Crops Research Institute for the Semi-Arid Tropics (ICRISAT), funded by the Indian Ministry of Rural Development, and implemented by an NGO, Bhopal Yuwa Paryavaran Shikshan & Samajik Sansthan (BYPASS). 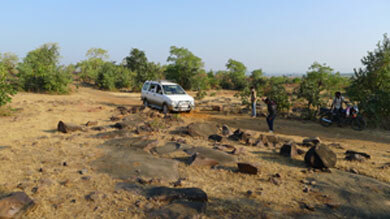 The approach road to the village is unmotorable. 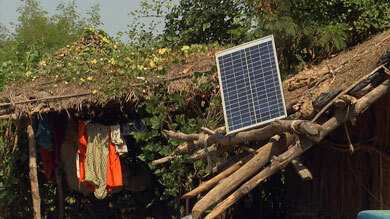 Solar panels sticking out of thatched houses is a common sight in Dunagaria village.